Buy 8+ for $14.99 ea. Buy 1 - 7 for $15.95 ea. Buy 8+ for $9.95 ea. 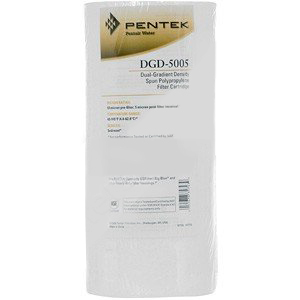 The Pentek DGD-5005 replacement water filter cartridge works as a pre- and post-filter to reduce extra fine sand, dirt, silt, rust, and scale particles. The outer layer of the this whole house water filter has a 50 micron rating which filters most of the larger sediment out of the water. The water then passes through the 5 micron inner polypropylene layer which filters finer sand, dirt, sediment, and scale particles. This filter eliminates the need for dual whole house filtration systems. This replacement water filter cartridge is NSF tested and certified and has as much as three times the dirt holding capacity as similar wound filters. For more information, View the Product Guide. 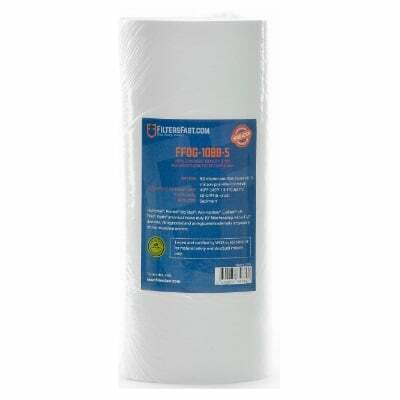 The FiltersFast FFDG-10BB-5 is the correct replacement water filter for the Pentek DGD-5005. 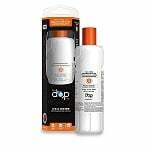 This inexpensive water filter simultaneously works as a pre- and post-filter to reduce extra fine silt, dirt, sand, rust, and scale particles from your tap water. 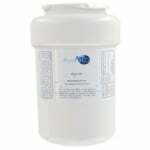 The outer layer of the this whole house water filter has an impressive 50 micron rating, that has the muscle to sift out most of the larger sediment from your water. Once that process is completed, the water then passes through the smaller 5 micron inner layers to filter the finer sediments that are not visible by the human eye. This process extends the life of the filter by spreading out the sediment load and eliminates the need for a dual filter housing setup. The FFDG-10BB-5 has as much as three times the dirt holding capacity as similar sized wound filters.